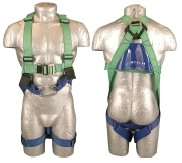 Two Point Soft Loop Harness complete with a dorsal (rear "D") attachment point and thoral soft loop attachment point. Suitable for general work application where there is a risk falling. Chest Size: AB20SL SML - Small - 32"- 41" AB20SL STD - Standard - 42"- 51" AB20SL XL - Large - 52" - 60"